Life’s Abundance Pet MLM Review – Dog Food Money? You are here: Home / Lifes Abundance / Life’s Abundance Pet MLM Review – Dog Food Money? Can you make money with Life’s Abundance Dog Food? When you look up the best pet mlm or even just a pet focused multi level marketing opportunity, there is one that stands out called Life’s Abundance. It is pretty simple how I chose Lifes Abundance mlm for the next “victim” of my mlm reviews run down. They were the only mlm company that showed up on my front page. Right off the bat, I knew I would be dealing with another unique mlm opportunity (remember, I just did Uppercase Living and Jamberry Nails), but I am a bit relieved that it is something not focused on humans. So as I started my journey into the Life’s Abundance review (www.lifesabundance.com) and tirelessly soak up the information out there from the web, I was a bit disappointed to find out that Life’s Abundance is another mlm that loses focus on their product by throwing in some of the more popular mlm niches. I don’t know what it is, but it feels dollar store. Remember that one mlm review I did and I just couldn’t stop talking about how much it seemed like a free for all mlm rather than one that was focused? Although Life’s Abundance doesn’t have a total thrift sale like (what mlm was that? ), it does still go off into another niche, which does make me question their commitment to their flagship products. Well, before we go knee deep into this Life Abundance Review, check out what Brad thinks of mlms and then think carefully about whether you really want to know more about yet another mlm. Please schedule a call, but only if you are serious about starting an at home business that clobbers most multi level marketing companies out there. Still want to know about Life’s Abundance mlm? The Life’s Abundance MLM – What is Life’s Abundance? Life’s Abundance is MOSTLY a Pet Food mlm. They sell grain free dog food and cat food and a mix of supplements and vitamins for them. Weirdly, they also sell Fish Oil and a Clay Mask product for you, the human. One of the most prominent things you will notice when going onto the Life’s abundance opportunity website is their lack of words and their videos of plenty. In order to find out more information about the compensation plan, you need to fill out your email, buy a starter pack and sign up to be a LIfes abundance distributor. To save you some time, (if you’re a reader of course), I have summarized what the main video and the compensation plan for the opportunity with Life’s Abundance is about, which happens to be a little mix of propaganda for you to join Life’s Abundance and some history of the Life’s Abundance Company and Business Opportunity. The Life’s Abundance video starts out asking who needs extra money, and then giving the explanation of the benefits of working for yourself. The video explains that Life Abundance is a great opportunity because of their everyday use products (pet food) and that they are consumable and often reordered time and time again which makes it a financially stable system. The video emphasizes that a Lifes Abundance business can be started with a minimal startup fee, very small overhead costs and no waiting to start making money. Life’s Abundance offers premium pet products that are desirable and able to shipped directly to your home on a schedule that is convenient for you. 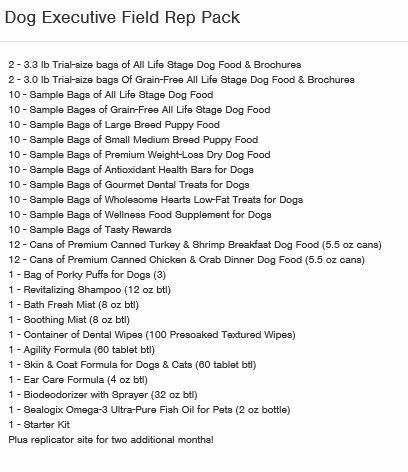 The Lifes Abundance Dog Food is just one of the many Vet formulated products. Pet products are formulated by an acclaimed holistic formulater. 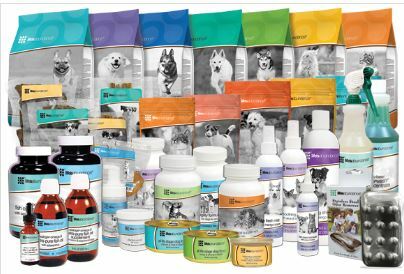 Premium food, treats, supplements and skin and coat products. A RATING WITH BBB AND HAVE BEEN AROUND SINCe 1998 AND PUSHED THROUGH THE DOWN ECONOMY. Financially stable company that gives you full support. If the video is any indicator, I’m going to go with a no..don’t join. They aren’t caught up with the times in my opinion and this video is outdated. On the other hand the Life’s Abundance company website is nice and is newer and similar to the Zrii mlm company. Life’s Abundance Products are constantly analyzed and overseen by Dr. Jane Bicks who is the Executive Director of the Life Abundance Product and Development along with the Education of the product. She consults with experts in the industry and is considered and expired in alternative veterinary medicine at a national level. Dr. Bicks comes with many accolades and has work experience in some of the world’s most prestigious associations. She has been seen on major network television stations as a guest veterinary expert on all types of animal species. As you can see, you can start making money with the Life Abundance Business Opportunity from $29.95 all the way up to just over $300.00. The Lifes Abundance Compensation Plan is similar to many other multi level marketing plans. As with Most Compensation Plans, the Lifes Abundance comp Plan summarizes for you the main way that you can make money with the Life’s Abundance Products. The quick start bonus is like the large majority of other beginning or starter bonuses that are offered by direct sales companies. When you show that you are committed to really diving deep into the Life Abundance opportunity, you are rewarded with a monetary amount. In the Life Abundance Comp Plan, you simply help one of your personally sponsored Life Abundance Field Reps to buy a commissionable product with the quick start bonus so that you receive the bonus. The quick start bonus is a way to reward you for building your business. The amount of the bonus is paid 100% to you and is not shared with an upline. There are no qualifications to receive the quick start bonus other than what is mentioned in this paragraph. The retail profit is the different between the amount you pay (the wholesale price) and what you sell it for. When your customer purchases Life Abundance Products from your site or over the phone, you receive the retail profit in a check from the company. If you invest in your own personal inventory, you immediately get the commission from the sales. The retail bonuses are reward for getting more customers. The retail bonus is a monthly payment that is based off of your personal sales for the prior month and can be anywhere from 5% to 20% in bonus. Many mlms and network marketing opportunities will have ways in which you can make money by brining on board friends, family members and others to help sell the mlm product with you. The number of people you bring in are placed below in a matrix called the “downline” and are directly beneficial to you if you are the one who sponsored them. Anyone that you sponsor is considered your Level 1 earners. When those level 1 sponsored representatives sponsor their own people, they are considered your level 2 as a part of your organization. At all levels of the mlm, you have an opportunity to make money off of a percentage of their commissionable sales. Many multi level marketing organizations are often referred to as genealogy or family trees. The building of your own tree or company with the Life’s Abundance Compensation Plan is where you can really start bringing in life changing money. This does not mean that you do not have to work because you will still have requirements and goals to meet in order to stay eligible to receive the money and bonuses that are offered to you as you help Life Abundance offer their products and grow your company. As a Life’s Abundance affiliate, you are given two ways in which to earn JUST for building an organization (this is in addition to the direct customer commissions you get). Each of the above mentioned categories in the Life Abudance plan are dependent on the Personal group sales and the rank that you achieve. You are paid in a “paid as” rank, which is the rank that you currently are earning within the month that the pay is being allocated. Your permanent rank refers to the highest rank you have ever achieved and may come with bonuses and rewards, however it is not considered your “paid as” rank. The “paid as” rank will always depend on the actual sales and sponsorship activity that you have each month. 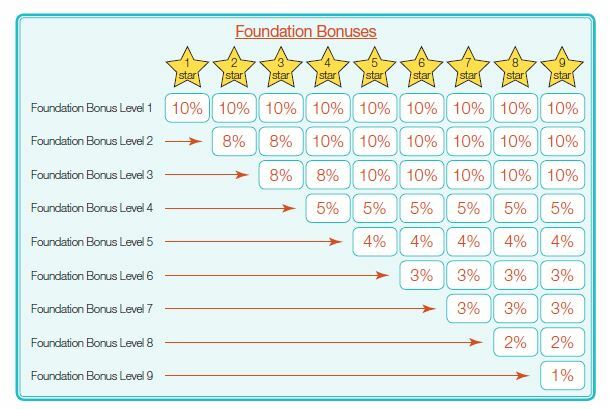 The foundation bonus is a reward for building your downline. When you help your personally sponsored field representative build their own companies within your organization, you get paid a bonus. The amount of the bonus is dependent on what levels you have in your organization, the sales of that level and the percentage you earn on the particular level where the money was earned. For instance, if you have peter make $100.00 and he is on your first level, you will make 10% off of his sales no matter what rank you are. However if you are a 2 star rank and Peter has one of his level ones sell $100 too, you get 10% of Peter’s sale and 8% of his downline sales. The nice thing about the Life’s abundance comp plan is that they practice compression. This is great because if someone on any of your levels does nothing and makes not sales, they are “compressed” or skipped and the person below them that is active will count towards the level you are skipping. Example? If Jane is on your third level and made no sales but here sponsored friend Fred (Your level 4 did make sales), Jane will be bypassed and Fred will be placed in your level three for the purposes of calculating commissions for that month. Once Jane gets her crap back in order and makes sales again, Jane will be in your level 3 again and Fred will fall back under Level 4. 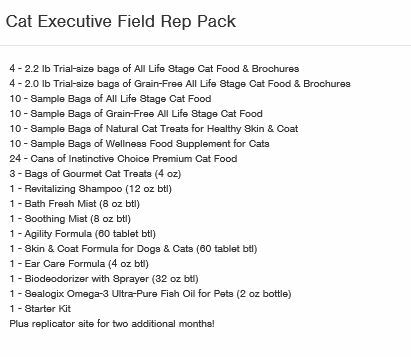 The unique thing about the Life Abundance comp plan is that you can actually get all the way up to a four star rank without ever having to bring in any other sales reps or distributors. That perk, however is brought to a halt once you reach your 4 star rank. Each leg will have one of these qualified persons in it. To become a 5 star rank, someone in the legs you have MUST have a 4 star ranking. In order to be a 6 star, you have to have two 5 star ranks in two of your legs and to be seven star, you must have two 6star legs and so on. Check out this Advance in Rank Chart. It’s a little confusing because the n/a might confuse you and make you think you don’t need a qualifying leg in order to advance certain ranks, so below the image, I will explain further. The 1 through 4 star all require $50 in personal sales. Anything above that is to be $100. The ability to qualify for 5 star and up relies on the number of qualifying legs. IN order to be a 5 Star, as mentioned, you need to have 2 4 star legs. 9 Star – Eight 8 Star or higher. This is a bonus that allows you to make money off of the entire Life’s Abundance organization. Each of these are SHARED with other Life’s Abundance Field Reps that are also in the same rank. IN addition, you will accumulate the bonus. This means that if you are an 8 Star, you will get paid the 8 Star star club bonus AND the 7 Star club bonus. How do you get Paid with Life’s Abundance Compensation Plan? All of the commissions that you make from Lifes Abundance is only paid through electronic means so you need to be sure that you click on the “Commission Payout Options” once you join Lifes Abundance and fill our your electronic pay information. Your Pay Periods begin on the first day of the month and end on the last day of the month. Quick Start Bonus – These bonuses are paid monthly in the month after the sale is made. Monthly Commissions – Everyday commissions are paid monthly on the 20th of the month for the month before it. You must qualify to receive monthly commission bonuses by having a minimum of $50 in your personal sales. If you do not have $50 in any given month all of your commissions will be forfeited for that month. In order to get a payout, you must have a minimum of $10 to be paid. Should you join Life’s Abundance? Life’s abundance has a pretty easy compensation plan in regard to understanding it, which is refreshing in a mlm world filled with confusing and point related comp plans. If you area pet lover, the Life’s Abundance product will allow you to share you knowledge and love for animals with others. You need to know how to drive traffic to get customers and how to get people to join your downline. There are no generational bonuses like many other mlm companies offer. The product does have an expiration date so there is a possibility of losing products if you don not sell them fast enough. You are still being told what you are allowed and not allowed to do and it’s not that far off from a 9 to 5 job. Overall I think Life’s abundance is a unique business opportunity for the right person. I believe that kennels and veterinarians are more likely the better field reps for this type of mlm, however, I can see this being good among dog trainers and groomers as well. No matter if you decide to join Life’s abundance or another online network marketing opportunity, it is clear that driving traffic is going to be a skill that you are going to need in order to be highly successful. Personally, I would not join without getting the proper online training and I would not trust Life’s Abundance training for online skills based off of what I see on their website. Their videos are a bit old and the fact that their website isn’t ranking #1 in some areas where it should indicated to me that they still have a few things here and there to learn about online marketing. That’s where Job Killing comes in. Job Killing (the program I’m in) is run by two Millionaire Mentors that teach you everything you ever wanted to know about getting traffic (the hard part), converting traffic into sales (the second hard part), and getting paid for the traffic you generate OUTSIDE of the mlm platform. The program works so well at teaching people how to get local leads that many mlm people have left their mlm opportunities altogether. Do you want to make money on your terms and not have to worry about a mlm company looking over you and not sharing your sales with others at the end of the year? It’s possible and I know the group that can teach you how to do it. If you are serious about building an online business or you want to find out how to improve your existing online business by getting a better online presence, schedule a call today. Please only schedule if you are serious because time is money. And…Just to prove that we aren’t faking it, check out these Job Killing Testimonials. You’ll find that we have teenagers, college kids, dentists, chiropractors, teachers and so much more who have made thousands with this program. Check out their testimonials and then why not join us? Pet Mlms now? Are there a lot of these? It just amazes me how many different network marketing opportunities are out there. How do you go about choosing which ones to review? Samantha, Thanks for the question. I have no idea how many pet mlms are out there. There are some mlms that are not initially pet mlms but that sell pet products through their opportunity. Off hand, I can’t recall which ones these are but I know I’ve done a mlm review on a couple so far. In regards to choosing the network marketing opportunities to review, it really depends on the day sometimes. I follow some great bloggers out there and will sometimes piggy back off of their ideas. Meanwhile, there are other times where I may hear about an interesting mlm opportunity and get so intrigued by it that I go about doing the review just because it helps mix things up for me. I don’t have one specific way to choose a mlm site to review. There are times where I’ll spend a little bit of time just plugging in names into google trends. And then other times, I’ll have readers of this mlm review site make suggestions…. So it really depends on the day. If you know an orderly way to go about doing them, I’m all ears! There are so many, I have no idea if I’ll ever catch up (yes…that is my goal…). 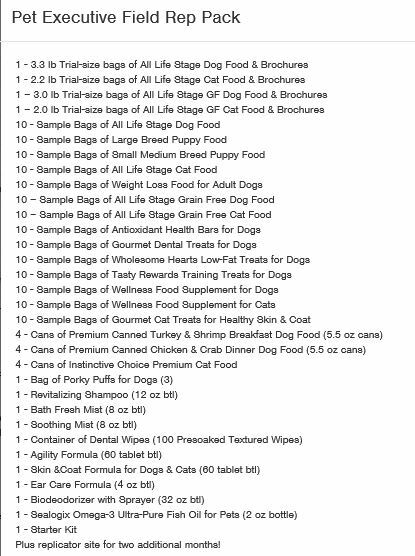 There were 2 pet food MLM’s when you posted this, as of today, there is 1. Life’s abundance. I was a distributor for Flint River Ranch, made an easy $$ each month selling an excellent food. They closed yesterday so out of my MLM as of today. Thank you so much for the update Laura! I definitely don’t mind the addition to my Life’s Abundance Review. I’m sorry to hear about the Flint River Ranch shut down! I’ll definitely check it out. I hope you had your own branded blog. It’s sooo important. If you’re looking for a great way to recoup without investing into another mlm, check out the Job Killing Coaching. I’m 100% a supporter of it. I actually have a great site (just started) that is filled with testimonials from people just like you.